It will soon be ‘Father’s Day’ again, that time of year when kids and adults alike are forced by the marketing machine of the greeting card and gift industry to buy something for their Dad. This means that the shops and the internet are stuffed to the gunnels (look it up) with products that are intended to appeal to us men. In reality we come in just as many different shapes and sizes (and ‘need states’) as other humans like women and children, but when it comes to packaging it can sometimes seem like there’s only one thing on our minds. If you think you know what that ‘one thing’ is well, yes, you’re (almost) right. What packaging for men is really about is helping us to be more manly, so we can become the Alpha male. And we all know what the Alpha male gets more of. Certain product categories have been speaking to men for decades, for example toiletries, alcoholic drinks (especially beer and brown spirits) and cigarettes. But nowadays male consumers do a substantial share of the grocery shopping, cooking, household cleaning and childcare, so packaging in all kinds of areas has had to ‘man up’ to attract our attention. But how does it do that? What are the packaging signals that modern men respond to? Having immersed myself in Father’s Day gift guides, supermarket shelves and the blogs of my fellow men, I identified plenty of recurring themes, for example: Animals, Tools, Tribes, War, Sport, Status, Independence, Simplicity and ‘when Men were Men’. I believe these themes and symbols are so prevalent because in different ways they tick the two boxes that our masculine primeval brains really need ticking: Survive and Reproduce. We’re looking for products and brands that are going to increase our chances of both. 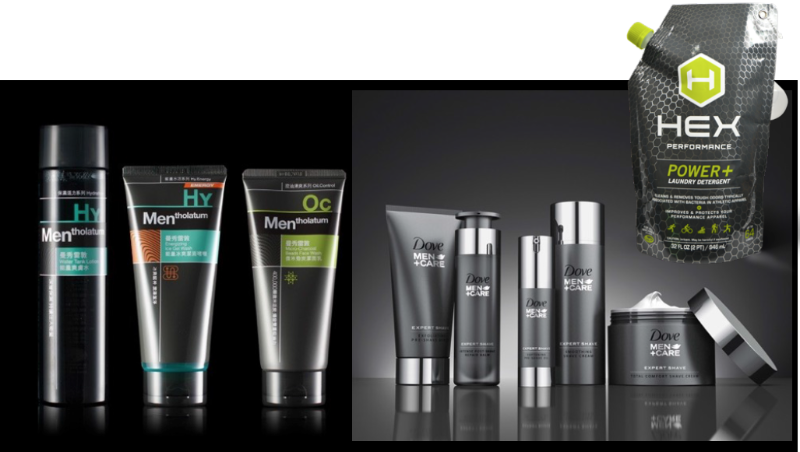 It’s a cliché that a lot of packaging aimed at men is black, but there are plenty of good reasons for that. Black is a symbol of strength. It’s what you get when you absorb every colour of the spectrum. Yoghurt is white, and it’s fair to say that in the past its associative network has been quite feminine: smooth, fruity, light, low calorie. Bring on yoghurt for men, or ‘Brogurt’. The utter transformation of this product into man food has been made possible by re-focusing its well-known health benefits not on fat or calories but on protein. Protein is a metaphor for muscle, hence we’re back to strength. Danone’s Oikos Triple Zero doesn’t stop there though. The name itself speaks to the male need to be rational, to base decisions on facts and information, not gut-feel and emotion. Emotions, we like to think, are for girls, and neuroscience studies suggest that men do indeed use the left-side of the brain more than women in decision-making (whose brains have stronger connections between the two halves, and so balance rational and emotional factors). Men are also more likely to be drawn to aspirational brands emphasising success, prestige and achievement, so the endorsement of the NFL brand will also help male buyers to justify their sudden interest in yoghurt. Becoming strong is not enough, it seems: Being able to prove to other men that you are ‘not weak’ is clearly important too. Yoghurt? No Man, it’s Oikos Triple Zero Protein snack endorsed by the NFL. In a black cup. According to Rousseau, Man’s central dilemma arises from the shift from our primeval state of autonomy, being free and happy and living in the forest, to the modern condition, dominated by inequality, dependency, violence and unhappiness. As a result humans (and especially Men) feel an unconscious affinity towards the natural world, which represents freedom from the social and political contract that is our daily reality. In terms of symbolism this doesn’t come any better expressed than the communication of the Epic brand: A ‘Paleo-friendly’ range of all-natural meat protein bars, sponsor of ‘Epic’ athletes such as Ultra Mountain Runners, and available in a range of different animals. Naturally this includes Bison meat, but the packaging makes even the Turkey and Chicken look like noble beasts of the High Plains. Without going into the moral or ethical arguments about modern meat production, there is no doubt that the idea of meat-eating is about more than simply getting protein (and by extension, strength). Over Millennia many cultures have believed that eating an animal endows the eater with the qualities of that animal, be it strength, speed, cunning, intelligence etc. Nowadays we might have a more rational, scientific and ethical understanding of the reality, but that hasn’t stopped categories and brands with a strong male focus from keeping the myth alive. As a result we still ‘consume’ animal qualities in the form of brands, and what we’re interested in are the teeth, claws and horns that animals use for hunting or fighting. As Men, we are subliminally arming ourselves with the weapons and aggression of wild animals to help us negotiate the modern urban jungle. Of course we don’t have to rely on nature to provide us with weapons. Men are an inventive bunch, and we’ve spent thousands of years making and perfecting our own, from the first flint axe to the nuclear bomb. Whether you agree with Mr Brown’s idea of how the world works or not, Men like to celebrate the fact that we make stuff, and this is very clearly reflected in the packaging of products we are attracted to. The language of ‘making’ varies from skilfully intricate and detailed to more basic and resourceful; but in both cases the tactile properties of materials is important – we want to touch and feel the metal, paper, wood, foils and embossed glass. 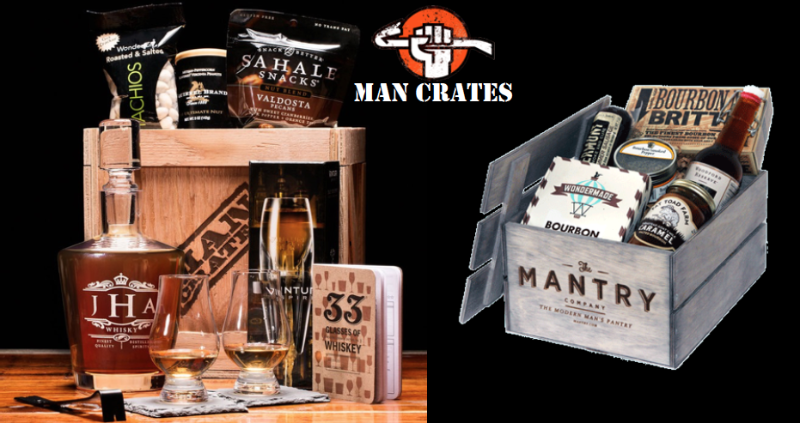 The enterprising US firm Man Crates has pioneered gift boxes for men that are not only full of manly products like whisky, beer and beef jerky, but also come in the form of a sturdy wooden crate or an ammunition tin. Humour is also a trait highly appreciated by men, and Man Crates doesn’t disappoint, describing its concept as: ‘Delivered in a sealed wooden crate with a laser-etched crowbar. No bows, no ribbons, no fluff and absolutely no instructions’. Actually on the website they apologise for the lack of instructions and now offer the following: ‘TRY HARDER’. It won’t have escaped your attention that we’re in the middle of a massive boom in all things ‘Craft’ right now. The Guardian reported recently that the UK Craft Beer market is growing at 79% per year, and it’s clear from all manner of food and drink festivals and even in Supermarkets that many other categories are following this trend, from spirits to crackers, cheeses to cosmetics. Packaging and advertising depend on craft skills too, so these emerging markets are natural places to find perfectly crafted designs and communication. Both can be found on this website. The word ‘technology’ derives from two Greek words, and it means: ‘the set of tools, devices, systems, methods and procedures by which humans order and transform matter, energy, and information to realise certain valued ends.’ Got that? A simpler definition might be ‘the sum of all human knowledge’, so it’s always increasing and becoming in some way ’better’. That’s what Men want for themselves too, so not surprisingly the visual and tactile language of technology features strongly in packaging for men. That means scientific or mathematical symbolism, codes and grids, highly engineered materials and finishes, and the colours of high performance machinery (including at least 50 shades of grey). As we’ve seen being a Man is a challenging pursuit, always preparing for some kind of battle whilst unconsciously longing for a return to the wild. Brands can be our power-ups, our weapons and the expression of our passions, but they can also be our trophies. This is how we can show other Men that we have wealth, power and status within our tribe. In real life joining a tribe is by birthright or election, but many brands offer us a shortcut to a world of prestige and acceptance by the powerful: The Club. Diageo’s new Haig Club is aimed primarily at Far East buyers, but there’s something for every aspiring Man in the launch film, directed by the one-time epitome of manly film-making, Guy Ritchie. The packaging is certainly outstanding and showy, providing an instant beacon of Alpha male status. And with a name like that it just had to be square, didn’t it? But if you don’t feel quite as ‘welcome’ in this particular Club as the movie’s title would suggest, then even the average Man has one final weapon in the locker: Humour. Amongst the dozens of values and qualities that Men believe they need to succeed, a good sense of humour (GSOH) is one of the most frequently cited in that all-important arena of their lives – dating. When wielded by a Craftsman, it can even create overnight business success too.